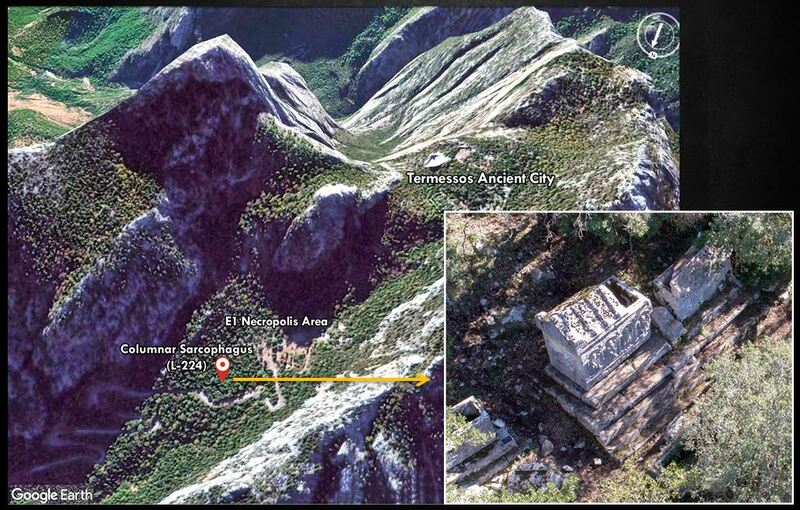 This study focuses on the application of digital imaging methods, Photogrammetry (Structure from Motion) and Reflectance Transformation Imaging (RTI) on a columnar sarcophagus located in the ancient city of Termessos (Turkey), E-1 necropolis. The work carried out on the sarcophagus produced results that contributed to the clarification of controversial issues from previous studies. With the help of the methods described here, figures depicted on the sarcophagus could be clarified and missing parts of the inscriptions could be added. The study shows the importance of preserving and documenting the artefacts and of observing the contributions of computational imaging methods to the archaeological and epigraphical research. 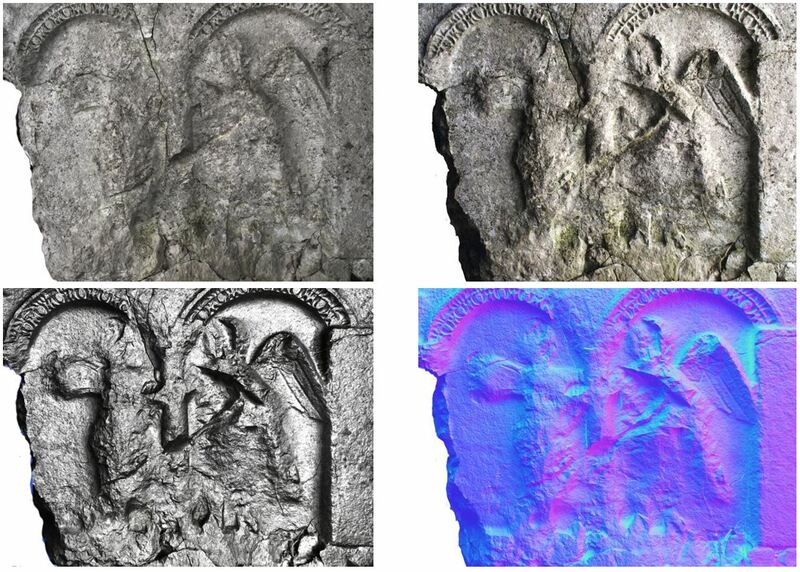 When we examine archaeological and epigraphical studies in general, we can see that besides the traditional techniques, the use of new digital imaging methods has increased in recent years. These methods make great contributions to the analysis processes of archaeological materials and attract the attention of researchers. The study presented here focuses on the application process and the analysis results of Photogrammetry (Structure from Motion) and Reflectance Transformation Imaging (RTI) of a sarcophagus (no. 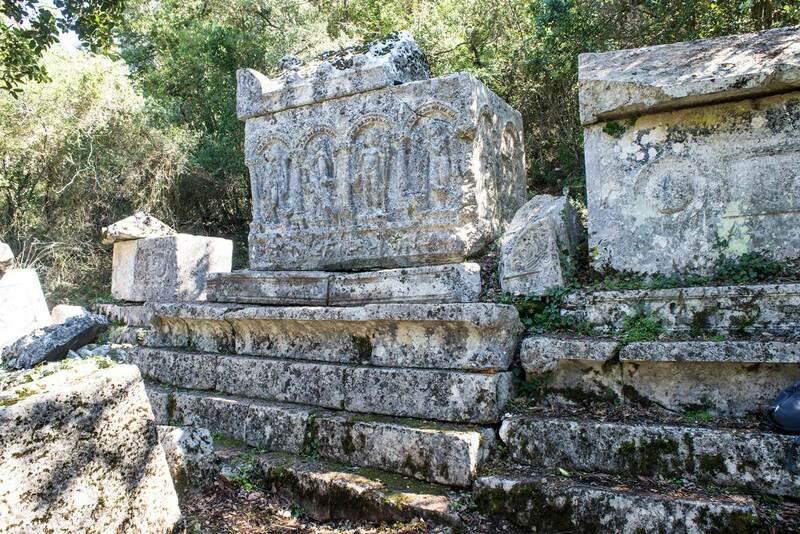 L-224) located in the E-1 north-eastern necropolis of the ancient city of Termessos. The columnar sarcophagus no. L-224 is the only known example in the group of columnar sarcophagi produced from local limestone in the Termessos necropolis. In addition to man-made destruction, the mechanical effects of various lichens and micro-fungi on the surface also led to erosion and made the surface visually complex. These elements weaken the visual perception of the surface and make it difficult to evaluate archaeological data using known research methods. The doctorate thesis prepared by A. V. Çelgin in 1990 investigates this sarcophagus extensively and presents the opinions and suggestions of different scientists’ related to the epigraphy and iconography of the sarcophagus (Çelgin 1990). Our study aims to present new data by applying dense photogrammetry and RTI methods related to the invisible or controversial points of the sarcophagus that is exposed to deformation within years in the ancient city of Termessos. Both methods allow us to conduct ‘non-destructive’ documentation and can be applied at low costs. In addition, the documentation of artefacts and the digitization of our cultural heritage is at an important point in this study, considering that destruction continues day by day. Structure from motion (SfM) is a photogrammetric method that is used to create three-dimensional digital model of objects by matching two-dimensional image data (photos) overlapping each other (Plets et al. 2015, 886.). There are various photogrammetry applications that can create digital three-dimensional surrogates of objects using SfM algorithms. In our study, we preferred Agisoft PhotoScan Pro to create digital models. In order to create a three-dimensional digital model, ‘image data’ was taken in the field, and 293 photographs were taken from all sides of the sarcophagus. During this process a 36.3 mpx. Nikon D800 dslr camera and Nikon 50 mm f/1.4g lens with minimal distortion rate were used. Furthermore, the scale bars that provides 1/10 mm accuracy, calibrated specifically by Cultural Heritage Imaging were used to obtain a model with precise metric measurements. During the process of the photogrammetric data, Intel Xeon E5-2630v3 dual processor, Nvidia Quadro K4200 and HP Z640 workstation with the operating system of 64 bit Windows 7 with 64 GB RAM were used. 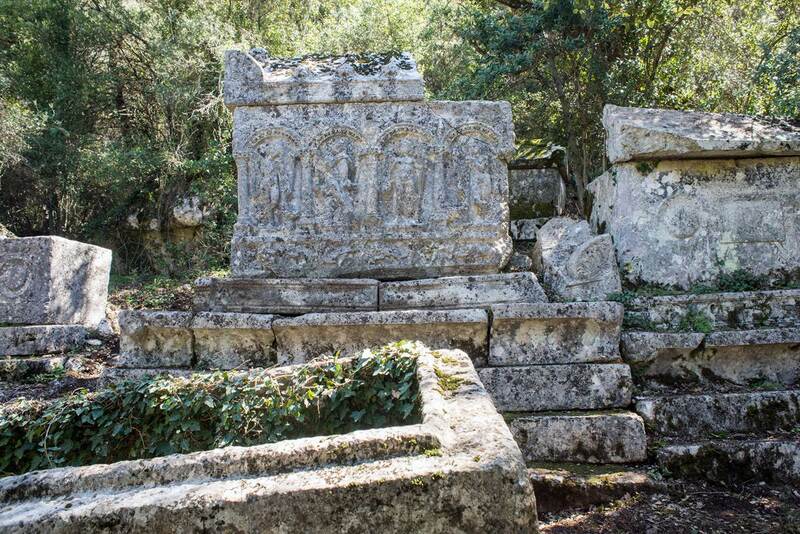 The documentation took quite long due to the dense vegetation, archaeological remains – the other sarcophagi and lid pieces – and also five-step podium on which the sarcophagus rose. These factors have narrowed the space to move around the object and made difficult to capture overlapping photos of the surface in the field. In order to overcome this limitation, a longer monopod and ladder were used to reach the upper parts (lid section) of the sarcophagus. Once the recorded image dataset was optimized in the computer, it was processed by SfM algorithms in Photoscan Pro software. During this process, the camera positions and orientations of photographic images of the artefacts were resolved on the software and the overlapping photographs were matched (Hess – Green 2017, 243). The dense cloud needed to create the surfaces from the aligned photos was created and the mesh view of the sarcophagus was obtained through using triangulation algorithms. Finally, the photo-realistic texture of the surface of columnar sarcophagus was processed and the documentation processes were completed (http://culturalheritageimaging.org/What_We_Offer/Gear/Scale_Bars/). The other method we applied during the digitization of the monument is Reflectance Transformation Imaging (also known as Polynomial Texture Mapping (PTM)) technology. RTI is a computational imaging method that provides precise and accurate data on surface morphology of the materials via synthesising the reflection values obtained by illuminating the object surface at different angles (For detailed information about the RTI method, see. Malzbender 2001; Mudge et al. 2006.). The method has been applied in many different disciplines in cultural heritage research and used as an auxiliary tool to contribute to analysis process of material culture remains in archaeological studies. There are two ways to create an RTI. 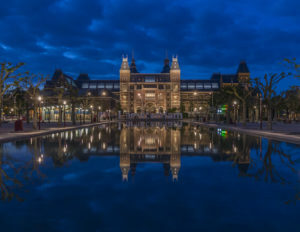 The first is to illuminate the subject automatically with a light array (previously known positions) that is placed in a dome or arm structure. This method is fast and useful for capturing small objects like coin, stamp etc. On the other hand it is expensive, difficult to transport and the object size is limited with the size of the dome (Mudge et al. 2012, 647.). The Highlight RTI (H-RTI) method can be applied with portable equipment and makes it possible to document immovable cultural heritage in remote locations. It requires a fixed camera to a tripod, reflective spheres and an external light source (external flash or continuous light). During the H-RTI record of the columnar sarcophagus in Termessos, we used the RTI kit of Cultural Heritage Imaging, Profoto B1-500 watt brand/model paraflash that is strong enough to absorb the strong sun rays and Tiffen neutral density (ND) filter in daylight. In order to examine iconographic objects and inscriptions on the front of the sarcophagus as part of a holistic analysis during the H-RTI studies conducted in Termessos, an attempt was made to document the entire front with a single RTI record. However, the differences in elevation due to the fact that the sarcophagus is located on a four-step podium prevented the light distribution required for the RTI registration to be carried out at the desired level. For this reason, the front of the sarcophagus was recorded in two separate pieces, while the narrow sides were recorded in one. The captured image data were processed in the RTI builder and the epigraphy and iconography of the sarcophagus were evaluated in the RTI viewer software. 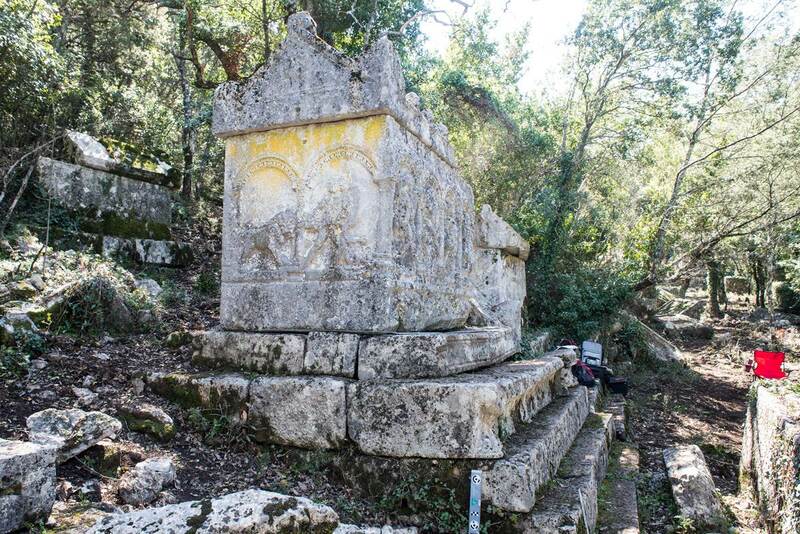 The sarcophagus in the Termessos necropolis rises on a high podium, and the three sides of the sarcophagus, including the angles, are depicted with various figures. Four arches and five columns are depicted on the front side of the sarcophagus, and one Eros figure is depicted inside each of the four niches between the columns. Three of the Eros figures are depicted in a standing position while one is depicted in a sitting position. In the spaces between the arches, there are Gorgon’s heads and on the angles, there are sitting sphinxes. The Eros figures in the niches are seen as young male figures.In the lower part of the facade of the sarcophagus, there is also a frieze area in which the Eros figures are depicted as they hunt various animals. Columnar facade architecture continues in narrow sides. On the narrow left side the Eros figure and the lion are depicted. The Eros figure is dragging the lion from a rope in its mouth and the end of the rope into a crater on the left side of Eros. The right narrow side is quite destroyed. For this reason, these figures were not identified during previous studies. The data obtained by the computational imaging methods that we applied to this area are shared in this study. 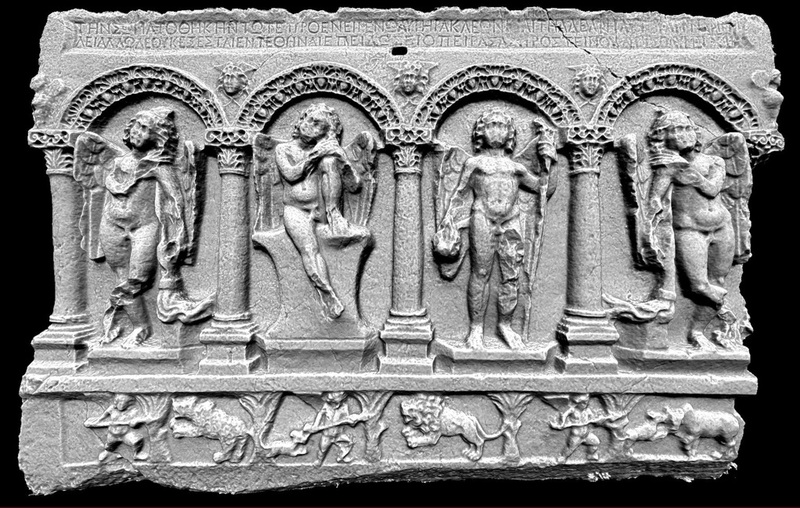 In the lower part of the facade of the sarcophagus, there is also a frieze area in which the Eros figures are depicted as they hunt various animals. Columnar facade architecture continues in narrow sides. On the narrow left side the Eros figure and the lion are depicted. The Eros figure is dragging the lion from a rope in its mouth and the end of the rope into a crater on the left side of Eros. The right narrow side is quite destroyed. For this reason, these figures were not identified during previous studies. The data obtained by the computational imaging methods that we applied to this area are shared in this study. Researchers conducted epigraphic studies on the inscription of the sarcophagus reached an agreement that beginning part of the two rows in tabula is missing and the incomplete section that cannot be found on the sarcophagus may have been engraved on another architectural material of the sarcophagus (Cousin 1899, 173 no: 18; TAM III/1 255 no. 832; Çelgin 1990, 398.). 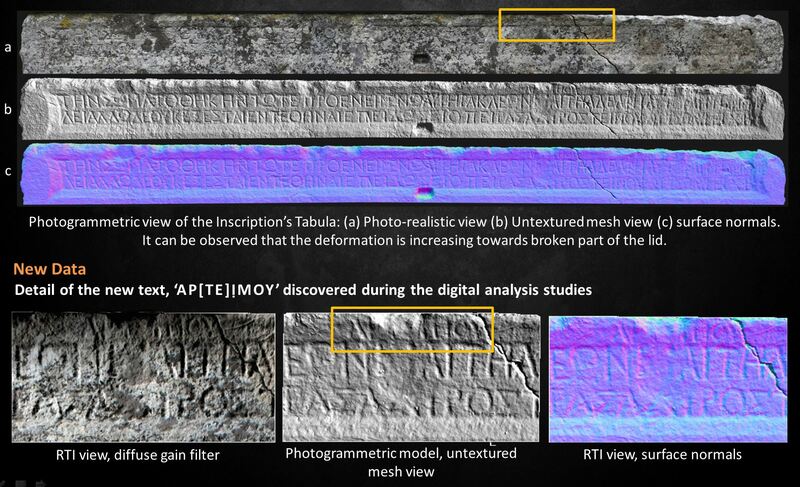 During digital analysis studies carried out on the data obtained from RTI and photogrammetry technology applied to the sarcophagus surface, a new text was discovered between the tabula and the lid of the sarcophagus that could complete the missing part of the inscription. It is almost impossible to recognize the letters on the third line by applying traditional methods such as photography, estampage sampling, tactile recognition and with visual recognition in the field. Our field observations have made it clear that this area is shaded by the projection of the sarcophagus lid even at a time of day when the sun position is not very high (in the afternoon). In addition, fungal factors (fungi, lichen etc.) covering the surface of the sarcophagus in this part weaken the visual perception. Furthermore, the fact that the letters are engraved in a smaller size (0.024 m) than the other characters on the tabula may have been the reason why the studies carried out to the present day were unable to recognize this part (Fig. 10-11). Firstly, considering that the newly revealed ‘Αρτείμου’ (son of Arteimas) name is engraved on the ending point of the Herakleon name on the bottom line and there is no other data before or after this name, we can suggest that the person who engraved the inscription forgot the name of Herlakleon’s father. If we assume that the ‘son of Arteimas’ was tried to be added to the Herakleon later, it will be clear that Aur. Herakleon was the son of Arteimas. Nevertheless, the identity of the person who commissioned the grave remains anonymous. As a second possibility, we can consider the ‘Αρτείμου’ genetivus as the missing (beginning) part of the inscription. From this point of view; ‘Αρτείμου’ is the person who commissioned the grave (ὁ δεῖνα κατεσκεύασεν) and the missing part in the beginning of the inscription must be ‘commissioned by ….., son of Arteimas’. When we examine the genealogies of the Termessians from the inscriptions found in Termessos, considering that Nannelis is the daughter of Arteimas in both of the possibilities we have discussed above, we come across a Nannelis whose father’s name is Arteimas in an honorific inscription. The inscription was published by Heberdey with a large genealogy (TAM III/1 43 no. 60). When we associate Aur. Nannelis with this data, Arteimas will be in the genealogy as the father of Nannelis, and Herakleon as the sister of Nannelis (Fig. 12). Updated genealogy of Heberdey. New family members are added to the genealogy (dark boxes). The RTI method we applied to the front side of the sarcophagus, revealed details that were not visible to the naked eye. The animal figure in the lower frieze area in the front side whose body was visible from the cross-section and head from the front was previously defined as bear; however, due to the imaging of its facial contours and other details such as hump, horns and ears, the animal figure was redefined as an ox. One of the most important factors that enabled us to see this change was the complexity caused mostly by fungal effects on the surface could be eliminated through photogrammetry and RTI, thus we can obtain the detailed image data of the surface which is not visible to the naked eye. There are diverse opinions about the objects in the hands of the Eros figure depicted in the third niche from the left on the front of the sarcophagus (Fig. 14). Heberdey recorded the object in the left hand as a venabulum (hunting spear) and the object in the right hand as a pera (money pouch) (Heberdey 1941, TAM III/1 254; Çelgin 1990, 405-406.). On the other hand, Koch did not give an opinion on the object in the right hand while he stated that the object in the left hand may be a thyrsos (Koch-Sictermann “in der rechten Eros mitThyrsostab (? )” 1982, 546 dn. 32; cf. Çelgin 1990, 406). Çelgin, who evaluated different opinions in the light of examples, argues that the objects are torch and wreath that we are accustomed to see frequently in the hands of Eros figures as their attributes (Çelgin 1990, 415). At this point, the data obtained from the digital imaging methods we applied to see the points that are deformed and difficult to identify, produced results that confirming V. Çelgin’s opinions. 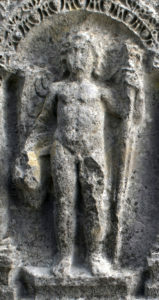 The fact that the figure is grasping the object in his whole right hand with his palm touching it and that there is a strip-shaped piece behind his fingers, support the opinion that the object is a wreath. There is also evidence proving that the object on the other hand is a torch. Another thing that draws our attention here is that the overall appearance of the figure is different from the other Eros figures in other niches. His robust posture carrying the weight of the body with two legs in a balanced manner, his head looking straightly across unlike other figures that lean their heads to the left or right as if they are pensive and especially his muscular abdomen distinguish this figure from the other Eros depictions. The literature studies we have conducted on this subject have shown that this could be the personification of the grave owner. The figure is considered to be a human figure carrying the light/torch with him on his journey to the ‘other world’. Since the right narrow side of the sarcophagus is quite destroyed, the figures there are not clearly defined, and different opinions have been put forward about the two figures in the niches in the studies conducted up to now. These depictions were interpreted by different scientists as wrestling Cupidos (Eroses) or Nikes (Victorias) (Heberdey TAM III/1 255; Çelgin 1990, 407; Koch-Sichtermann 1982, 546 fn. 32; cf. Çelgin 1990, 407-408.). V. Çelgin stated that the figures might be Eroses quarreling over palm leaves, as seen in grave art (Çelgin 1990, 420-423). Thanks to the digital image data we obtained in our study, we could define the figures as Eros and his lover Psyche (Fig. 15). In particular, the wing lines starting from the back of the figure in the left niche and ending again in the back after drawing an oval line, resembles a typical Psyche wing. In addition, waist holes, hip lines and garment curves that can be seen slightly under the knee make it clear that the figure is depicted as she pushes her left leg backwards and the right leg stepping with the toe. The figure in the right niche is another Eros figure with a wing that looks very similar to other Eros figures on the sarcophagus. There are many examples in the grave art where these two are depicted together. However, due to the diagonal fracture on the sarcophagus starting from the shoulder of Eros and going down to the Psyche’s knees, no definite conclusion has been reached about the postures of the figures and how they relate to each other. However, when we look at the composition of Eros and Psyche in the grave art, we can see that the figures are generally depicted as hugging or kissing each other. On the other hand, while compositions where Eros and Psyche are hugging each other are rarely seen in Asia Minor, no compositions depicting Eros and Psyche hugging each other have been discovered in different niches on columnar sarcophagi. 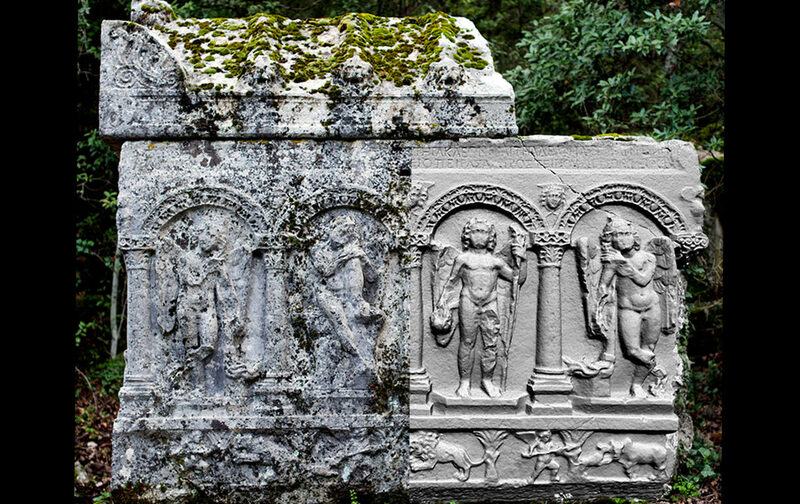 The closest example we found is the Eros and Psyche figures on a columnar sarcophagus in Tripolis, Buldan/Denizli (See: http://www.kulturvarliklari.gov.tr/TR-139625/tripolis-antik-kentinde-supriz-lahit.html). When we compare these two different depictions, we can see that they are quite similar. This determination we have made contributed to the knowledge of all the figures on the grave and to the iconography of the sarcophagus. This case study has demonstrated the importance of the preservation of monuments and their documentation as well as the contributions of detailed analysis studies to archaeological and epigraphic research. In this context; new epigraphic data which could not detected during the previous studies in Termessos, have been revealed. Based upon these data, a new genealogy is suggested to complete the family of the grave owner, addendum and corrigendum are made on the inscription. After the digital analysis of sarcophagus’ iconography, it is suggested that the figure depicted on the front side holds a torch in his left hand and a wreath in his right hand, and that this figure could be the grave owner depicted like an Eros. Also, on the lower frieze where the Eros figures are depicted in a hunting scene, it is documented that the animal figure depicted on the right-corner was not a bear, as previously recorded, but an ox. Finally, it has been determined that the controversial figures depicted on the damaged right narrow side of the sarcophagus are Eros and Psyche. In addition, the sarcophagus is documented and transferred to the digital environment precisely and our cultural heritage is now preserved digitally against any possible physical destruction. Cousin 1899 G. Cousin, “Termessos de Pisidie”. BCH XXIII (1899) 165-192; 280-303. Çelgin 1990 A. V. Çelgin, Termessos Kenti Nekropol’leri. Yayınlanmamış Doktora Tezi, İstanbul Üniversitesi. İstanbul 1990. Heberdey 1934 R. Heberdey, “Termessos”. RE V A-l (1934) 732-778. Hess – Green 2017 M. Hess – S. Green, “Structure from Motion”. Eds. A. Bentkowska-Kafel – L. MacDonald Digital Techniques for Documenting and Preserving Cultural Heritage, Bradford (2017) 243-246. Koch – Sichtermann 1982 G. Koch – H. Sichtermann, Römische Sarkophage. München 1982. Mudge et al. 2006 M. Mudge, T. Malzbender, C. Schroer – L. Marlin, “New Reflection Transformation Imaging Methods for Rock Art and Multiple-Viewpoint Display”. Eds. M. Ioannides, D. Arnold, F. Niccolucci – K. Mania, The 7th International Symposium on Virtual Reality, Archaeology and Cultural Heritage (VAST’06), Eurographics Association, Nicosia, Cyprus (2006) 195-202. Plets et al. 2015 G. Plets, W. Gheyle, G. Verhoeven, J. de Reu, J. Bourgeois, J. Verhegge – B. Stichelbaut, “Three-dimensional recording of archaeological remains in the Altai Mountains”. Antiquity 86/333 (2012) 884-897.